In milestones, American Silver Eagles topped 16 million in sales and American Gold Eagles logged their strongest sales day since January 2. Gold, silver and other precious metals rebounded Tuesday as buyers stepped in at comparative bargain levels following steep declines in the previous session. Gold for June delivery settled up $26.30, or 1.9%, to $1,387.40 an ounce on the Comex in New York. Prices traded from an intraday low of $1,321.50 to a high of $1,404.20. Emotions were less frayed Tuesday as gold rebounded well off its overnight two-plus-year low. However, there remains a bit keener anxiety in the market place, with much for traders and investor to ponder as the week plays out," notes Jim Wyckoff in the PM Kitco Metals Roundup. "This week’s price action in many markets, including gold and silver, will likely be extra important for price direction in the coming weeks," he added. On Monday, gold plummeted $140.30, or 9.3%, for its biggest one-day loss since 1980 and its lowest closing price since February 2011. "People may be starting to get a little nervous about whether gold is continuing its run over the last decade or so, where it’s always increased in price on an annual basis," Bloomberg quoted Alexandra Knight, a Melbourne-based economist at National Australia Bank Ltd. "They may be getting to the stage where they realize it’s not an ever-increasing asset." Silver for May delivery came back 26.7 cents, or 1.1%, to close at $23.628 an ounce. Prices ranged from $22.00 to $23.975. The white metal plunged $2.97, or 11.3%, in the previous session to settle at its lowest level since October 2010. July platinum gained $25.80, or 1.8%, to $1,450.60 an ounce, trading between $1,374.60 and $1,464.80. Palladium for June delivery added $11.20, or 1.7%, to $678.20 an ounce, ranging from $668.50 to $689.90. Sales of U.S. Mint gold bullion coins were muted Monday but soared on Tuesday. American Gold Eagles surged 33,000 ounces, the highest one-day total since the 2013-dated versions launched on Jan. 2. Sales with half of April over stand at 83,500 ounces, surpassing the monthly totals from March and February. The U.S. Mint also sold 2,500 ounces of American Golf Buffalo coins. Combining the Eagles and Buffaloes, 35,500 ounces of gold coins moved Tuesday. If the week ended today, it would already rank highest for gold coin sales since the one ending Jan. 11. America Silver Eagles advanced 503,000 Tuesday, bringing the year-to-date total to 16,438,000. 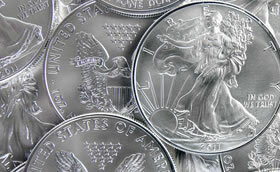 Last year Silver Eagle sales did not top the 16 million mark until June 19. Year 2011 holds the annual sales record for the bullion coins at 39.8+ million. That year it took until May 9 for Silver Eagles to surpass 16 million. All bullion figures above are in the number of coins sold. Calculate total ounces by using the bullion coin’s weight. 2011-2012 America the Beautiful Five Ounce Silver Bullion Coins sold out on March 1. The U.S. Mint is not yet selling any of this year’s five ounce coins. One coin store owner (and columnist-Ed Steer) reports shortages and delivery delays of weeks for many bullion products. Gold got another $100 before it starts to rebound on last month. The paper price may have dropped for silver but you certainly can’t buy it at those prices. Apmex/provident/gainesville and my local guy all have raised their premiums so it’s still closer to $30 to purchase 1 silver eagle. It’s amazing that demand is as strong as it is yet the price continues to drop. Something doesn’t add up. Greg… Re ‘Something doesn’t add up.’ Suggested reading is anything by Ted Butler. He is the silver guru as far as price action and manipulation, having studied the market for decades.